Ten Key Facts - Constitutional Income: Do You Have Any? 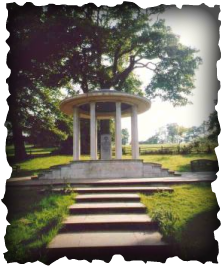 The monument on the meadow of Runnymeade, England commemorating the signing of the Magna Charta, 1215 AD. Fact #1: "In examining the history of the debate and ratification of the 16th Amendment, this book will show that there is no evidence upon which the government can rely for their claim that the American People desired to have their wages and salaries taxed. No evidence can be found in the law journals of the time, not in the journals on political economy or economics, not in the Congressional Record nor other Congressional documents, nor in any of the newspapers of record of the time. In other words, the government's position that wages and salaries equals income within the meaning of the 16th Amendment is 'wholly without foundation.'" Phil Hart, Constitutional Income: Do You Have Any? page 10, (Alpine Press, 2001). Fact #2: A tax on wages payable by the wage earner is a Capitation Tax. So says the premier authority on the issue, Adam Smith author of the timeless work Wealth of Nations. Ibid. pp. 141-145. Fact #3: Capitation Taxes are direct taxes and are required by the Constitution to be apportioned among the 50 States. The 16th Amendment had nothing to do with Capitation Taxes. Ibid. pp. 250 - 253. Fact #4: In the few hours just prior to the Senate's passage of the 16th Amendment the morning of July 5, 1909, the Senate twice by vote rejected two separate proposals to include direct taxes within the authority of the 16th Amendment. Ibid. pp. 193-200. Fact #5: In briefs and argument before the Supreme Court in the case of Brushaber v. Union Pacific Railroad, both Brushaber and the Government claimed that the 16th Amendment provided for a direct tax exempted from the Constitutional apportionment rule. The High Court called this claim an "erroneous assumption...wholly without foundation." Ibid. pp. 204-210. Fact #6: Just weeks after the Brushaber Case was decided, Mr. Stanton, in the case of Stanton v. Baltic Mining Co. again claimed (35 times) that the 16th Amendment created a new class of constitutional tax, that being a direct tax exempted from the apportionment rule. The High Court said in this case that the 16th Amendment created "no new tax." Ibid. pp. 212-220. Fact #7: In the Stanton and Brushaber Cases, the Supreme Court ruled correctly by excluding direct taxes from the 16th Amendment. The intent of the American People and that of Congress was never to directly tax the American People, but only to tax income severed from accumulated wealth. Ibid. pp. 244 - 270. Fact #8: When the Supreme Court stated in the Eisner, Stanton, and Doyle Cases that "Income may be derived from capital, or labor or from both combined" all these cases dealt with corporations and had nothing to do with the "Are wages income?" question. Ibid. pp. 239-244 and 272-274. Fact #9: The genesis of the 16th Amendment was the income tax plank of the Democrat Party's Presidential Platform of 1908 which clearly reveals the intent of that Amendment: "We favor an income tax as part of our revenue system, and we urge the submission of a constitutional amendment specifically authorizing Congress to levy and collect a tax upon individual and corporate incomes, to the end that wealth may bear its proportional share of the burdens of the federal government." Ibid. p. 48. Fact #10: There is not, and never has been, any delegation of authority from We the People to the government for the collection of an unapportioned direct tax on the wages and salaries of the American People. It has been a maxim of English Law since the Magna Carta of 1215, that the People must consent to all taxation. "We are being taxed without our Consent!" Ibid. p. 278. To read these above quotes in context, buy a copy of Constitutional Income: Do You Have Any? This book is the only exhaustive analysis of the intent of the American People in supporting an income tax amendment to the Constitution. Constitutional Income: Do You Have Any? proves without a doubt that the purpose of the 16th Amendment was to bring tax relief to wage earners. Constitutional Income: Do You Have Any? is available from Alpine Press at $25 a copy and you can order online right now!. Petition for Writ of Certiorari to the Supreme Court Docket #02-84 is available from Alpine Press for $32.00 per copy.